Tech’s 66-31 thrashing of the Louisville Cardinals last Friday night represented many things. For one, it was a turning point in their season, making the jump back to being a .500 team. For another, it was a show of strength against a genuine opponent But most importantly, it was revenge — bloody, gory vengeance, claimed by none other than Paul Johnson himself. Johnson’s path to Friday’s game began not last week, but years ago, before Johnson and his option-offense had risen to national prominence thanks to his efforts at Navy and Tech. As offensive coordinator, Johnson installed his famed triple-option offense for Georgia Southern and ran it successfully before leaving for Hawaii and later Navy in 1987. But Johnson returned to his first home in 1997, joining the Eagles as their head coach, and catapulted the program to unheralded success, bringing home two NCAA DI-AA national championships and posting a 62-10 record. As a result, he was hired back to Navy to be their program’s head coach, bringing his signature offense along to Annapolis, Md. But when Johnson left Statesboro, his triple option remained under the care of his former offensive coordinator Mike Sewak. Sewak stepped in as head coach in Johnson’s absence, and again found immediate success. But when Sewak was fired after the 2005 season, in came new coach Brian VanGorder. VanGorder had previously been a defensive coordinator for the University of Georgia, and received rave reviews for his rush defense. When VanGorder was offered the Georgia Southern head coaching position in 2006, he took it and continued his crusade against all things rushing — not only did he bring his rush defense to Statesboro, VanGorder expelled the triple option that had worked so well for Georgia Southern in the past. Worse, VanGorder jeered at the option on its way out. Georgia Southern published promotional clips that included VanGorder saying to the camera, “There is no option.” VanGorder claimed that he was bringing Georgia Southern into the twenty-first century. For Johnson, the triple-option’s greatest champion, this was sacrilege. Upon hearing about VanGorder’s comments, Johnson allegedly called up his athletic director and demanded that Navy be scheduled for a game against Southern. Why? “‘Because I want to beat the hell out of Brian VanGorder,” he allegedly said. VanGorder had dug his grave. The game never materialized, as Brian VanGorder led Georgia Southern to a 3-8 record, at the time their worst in modern history, and left after a single season. Despite his rocky history defending the triple option, VanGorder still presented himself as an expert in preparing for it. After finding work as Louisville’s defensive coordinator, VanGorder continued to present himself as such, even discussing with the press prior to Friday’s game his secrets and strategies for defending the triple option. VanGorder’s credibility is now shot. With the Jackets up 52-17 in the fourth quarter, Johnson kept pressing and kept scoring. 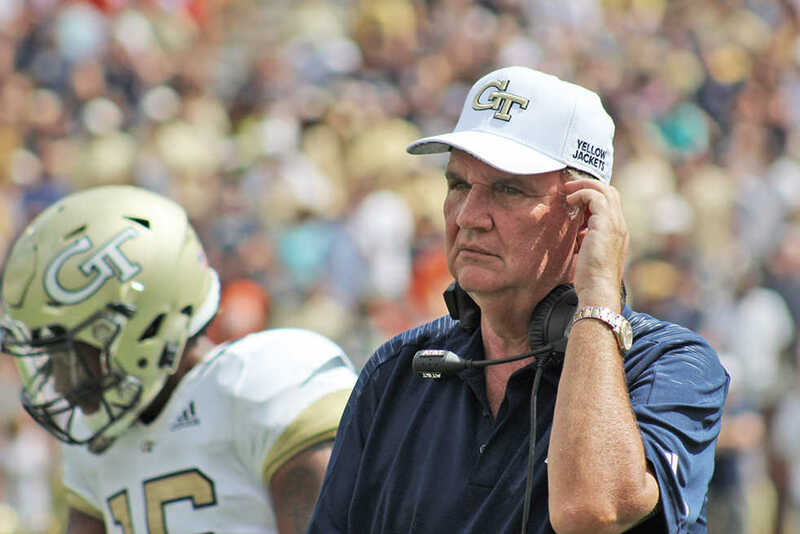 Such are the ways of Paul Johnson.